These slippers make an ideal gift, so the patterns both include a sizing table to guide in selecting which size to knit according to shoe size. These patterns will work hard for you! 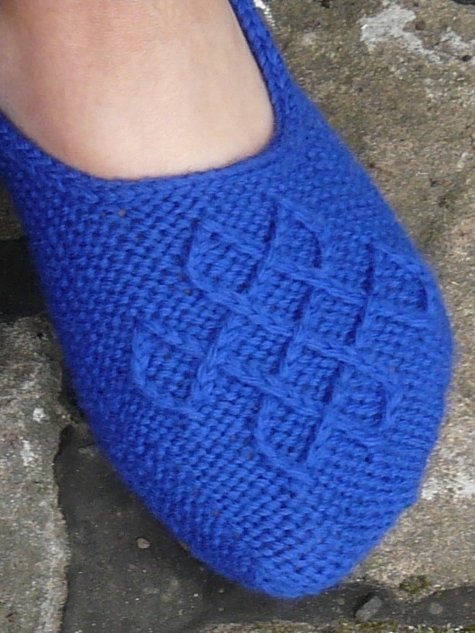 The slippers have a seamless toe-up construction. Full written instructions are given for each stage of the project. Charts are also included for the knot motif. Tutorials for the special techniques used (Turkish cast-on, knitting through the back loop, applied I-cord, wrapped stitches, and a provisional cast-on) can be found on the support page (see menu above). knitted with Opal Uni (a 4ply sock yarn).. Suggested needle size is 3.75mm/US 5 for the main slipper, and 3mm/US 2.5 for the I-cord edging. Choose appropriate needles for your preferred method of small diameter circular knitting; either DPNs, two medium length circulars, or one long circular (for ‘magic loop’). Tension/gauge is 5.5 stitches and 7.5 rows = 2.5cm/1″ in reverse stocking stitch/stockinette on 3.75mm needles. Both patterns (mens’ and ladies’) are included in the purchase.